Boko Haram extremists returned almost all of the 110 girls abducted from their Nigeria boarding school a month ago with an ominous warning, witnesses said Wednesday. DAPCHI, Nigeria (AP) — Boko Haram Islamic extremists brought back nearly all of the 110 girls they had kidnapped from a boarding school last month, dropping them off in the middle of the night Wednesday with a warning: "Don't ever put your daughters in school again." Several of the girls interviewed by The Associated Press said they had been traveling for days before the convoy of vehicles arrived in the center of the town of Dapchi around 2 a.m. Residents who had fled upon hearing that Boko Haram was headed their way watched from hiding as dozens of girls descended from the vehicles apparently unharmed. "We were freed because we are Muslim girls and they didn't want us to suffer. That is why they released us," said Khadija Grema, one of the freed girls who said a Christian classmate remained captive. The Nigerian government denied that it had paid a ransom or made a prisoner swap in exchange for the girls' freedom. The girls were released "through back-channel efforts and with the help of some friends of the country, and it was unconditional," Information Minister Lai Mohammed told journalists in the capital, Abuja. The girls were meeting with counselors at a nearby hospital, and "will be quarantined and be counseled before they go back to their schools," he added. Nigeria's government later said they were being taken to the capital on a military plane. The fighters had rolled into Dapchi in nine vehicles and the girls were left in the center of town. As terrified residents emerged from their homes, the extremists issued an ominous warning, resident Ba'ana Musa told the AP. "We did it out of pity. And don't ever put your daughters in school again," the residents said the extremists told them. Boko Haram means "Western education is forbidden" in the Hausa language. 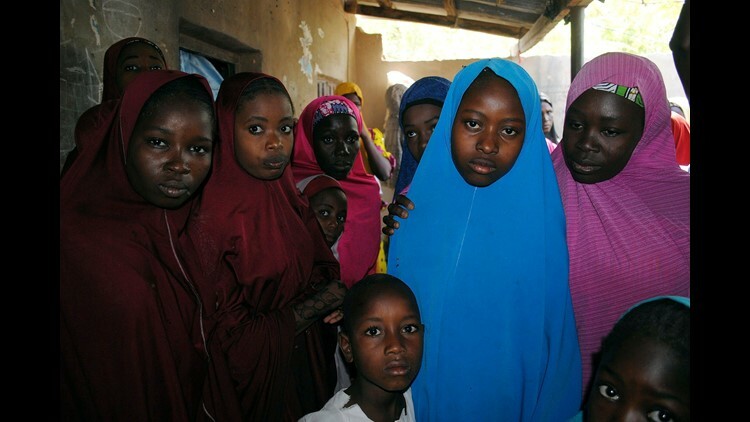 Nigeria's government said 104 of the 110 schoolgirls had been confirmed freed. Wednesday's miraculous development also brought renewed focus to the 100 Chibok girls still missing since April 2014. Coincidentally, some of the Chibok families had already made plans to travel to Dapchi that day to lend their moral support before it was known that most of the girls had been released. Some of the Chibok families instead joined in rejoicing with the Dapchi parents, said Lawan Zannah, secretary of the Chibok parents' association.